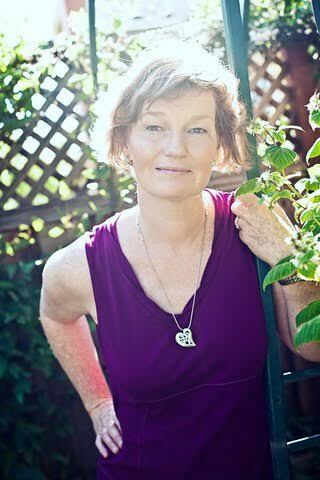 Friday Feature: Reader of the Month - Meet Alys! 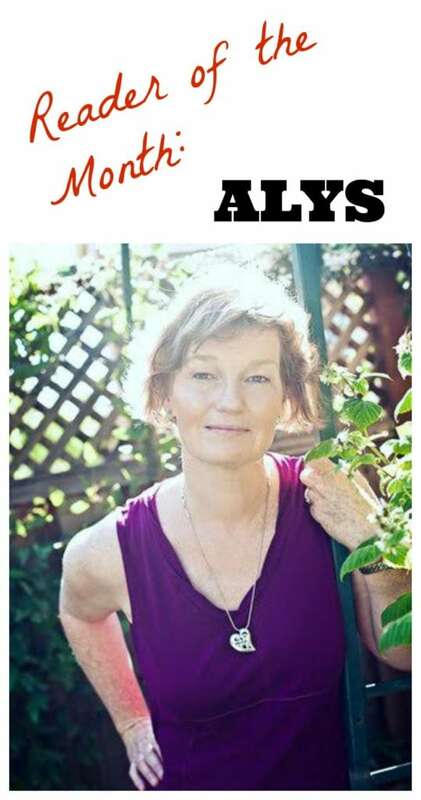 You are here: Home / Lifestyle / Featured Readers / Friday Feature: Reader of the Month – Meet Alys! 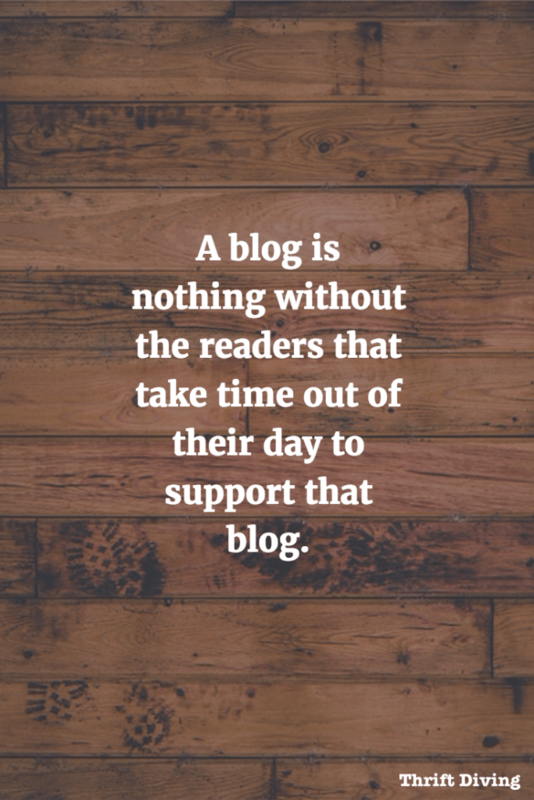 A blog is nothing without the people that take time out of their days to support that blog. I can count on fingers and toes the number of times I’ve lamented about how I don’t have “X” number of pageviews like “so-and-so” blog…and that I’m not as successful, creative, well-known as “so-and-so” blog. I could go on and on with examples of how I used to beat myself up in comparisons. But in the past year since losing my day-job, I’ve become much more clear on the fact that none of that crap matters. It really doesn’t. Because there’s something that makes Thrift Diving special–you readers! Do Readers Still Care About Bloggers? I’ve also heard that people have attention spans shorter than a goldfish! HA! (Hmmmm….now that one may be true….). But that’s not the case with this blog. Readers here read my posts and leave the most thoughtful, encouraging “Go Serena!” compliments, and more, and I can’t thank you enough for that! I may not be the biggest blog, or have the fanciest blog design. But dogggonit, that doesn’t matter to you, and I love that. You appreciate the quality of my writing, the creativity of my projects, and the thoughtfulness of my ideas! And because you support me so much, as thanks, I want to feature one of you each month! I couldn’t help but kick off this monthly feature with Alys. The reason why I love Alys (not just because she has left 92 comments on this blog since subscribing!!) is because she leaves the most thoughtful responses! Reading blogs and commenting takes a tremendous amount of time, and Alys never fails to leave a kind word on every blog post I wrote. I appreciate her so much and wanted to send some love her way and showcase her own creative projects! 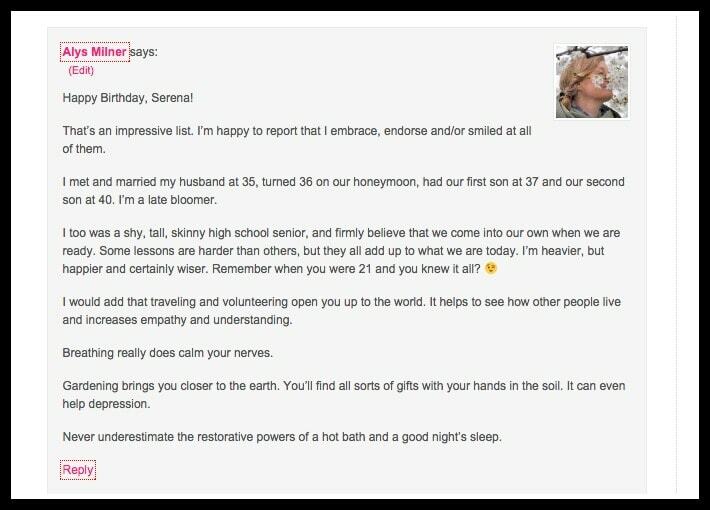 When I turned 38 last year (click here to read the post), she had some words of wisdom that she’s learned while on this earth, too. So let’s get to know Alys! I live in San Jose, California, the heart of Silicon Valley. San Jose is about fifty miles sound of San Francisco. I’m originally from London, Ontario, Canada, but moved here with my family in 1966. I started in college, unable to afford anything but the bare essentials. Our mom kept herself and her daughters clothed by shopping at thrift stores after our father died. For several years, I avoided thrift stores because they evoked painful memories of our childhood poverty. I’ve moved beyond that and enjoy frequenting them when the mood strikes. I am proud of my vintage stamp table for sentimental reasons. It was really scary building up to the day when I actually started to decoupage dad’s stamps, but I fell in love with the table and enjoy seeing it every day. It’s much nicer having his stamps in a place where I can see them and honor them and the wonderful man that he was. Hmmm…that’s a tough one. I challenge myself each year to make a costume from thrifted items. 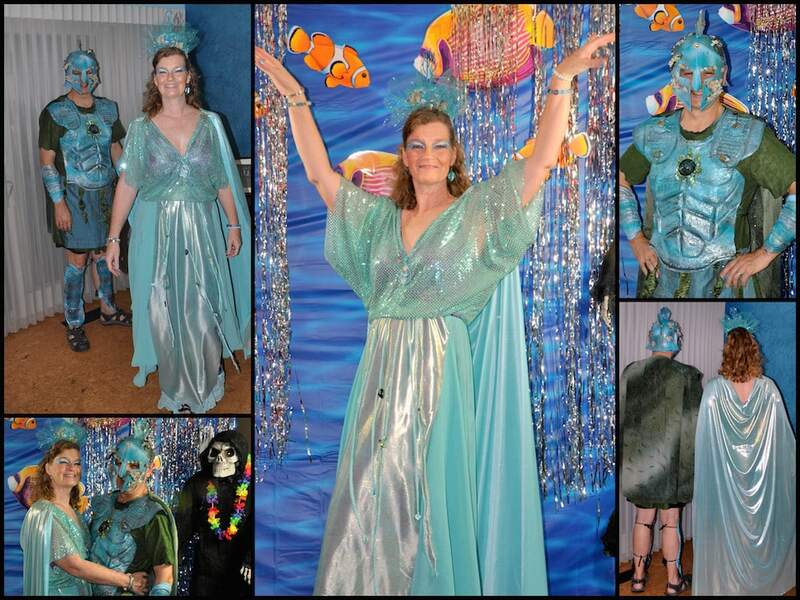 I made under the sea costumes using thrift store fabric, a funky pantsuit for a cape and a dress and jewelry findings for the costume and headpiece. My most recent make is an improvised birdbath using a child’s discarded table and chairs. Here’s the link. I found Thrift Diving via Leilani of Keeping Up with Mrs. Smith. I’m a fool for makeovers and DIY on a dime, so fell in love with your posts. I continue to follow because you have a warm and inviting writing style, great tips, and a sincere and approachable manner. I’ve learned a lot from your posts, and I always have a good time. I enjoy Keeping up with Mrs. Smith and Kelly’s Korner and try to never miss a post. I’m also a big fan of Hometalk. 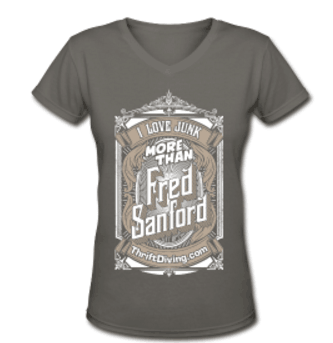 As a way of saying THANKS, I’m also giving Alys a free Thrift Diving t-shirt! I hope you all enjoyed getting to know a little bit about Alys! Be sure to check out the links to her blog, Gardening Nirvana. Next month we’ll be featuring another awesome Thrift Diving reader! Love this idea! Nice to meet you Alys. 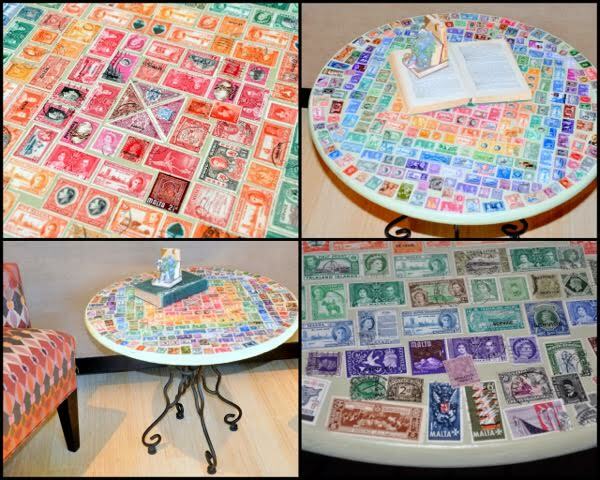 I love the stamp table… such a good idea. Hi Alys! Glad to meet you! I started “junkin” at 8 and never looked back. Can’t wait to check out your blog! Alys!! I’m Gwen and I’m pleased to meet you!! I got lost in clicking and clicking on your blog? You are creative and have fun yard ideas too. I’d have to choose the bedazzled garden watering can because it’s so ridiculous!!! I enjoy watering too but I’m not great at adapting to the drought. Things in the evergreen family have been dying down here in Bake-ers field. Have you completed one of Serena’s challenges?? I invite you to do one if you haven’t. I spruced up my yard and styled a little potting hmmm is it called bench? Mine is more decorative to give interest to the utility side of my house. And I’ve had luck rooting three things there too! Once again, I enjoyed your blog plus your awesome costume and video. Gwen, it’s nice to meet you. Thank you for visiting my blog. I’m glad you had fun there exploring what I’ve been up to. Do you have a blog as well? I would love to see what you’ve done with your yard. Bakersfield is hot! You must be chasing the shade all summer long. I haven’t done a challenge yet, but love reading all the projects she posts of others. I’ve probably seen yours if it was in the past year. Perhaps you can share the link here? Alys is a gem for sure! Relationship is what it’s all about and I’ve learned this even more thanks to her.